From left to right, Geoffrey Yoder, Michael Watkins, Rick Nybakken, Richard Cook and Jan Chodas celebrate in Mission Control at NASA's Jet Propulsion Laboratory as the solar-powered Juno spacecraft goes into orbit around Jupiter on Monday, July 4, 2016. There were hugs, “high fives” and handshakes at Juno mission control at Jet Propulsion Laboratory Monday, as the unmanned spacecraft completed its engine burn to enter Jupiter orbit and start its 20-month mission mapping the giant planet. Scientists and engineers in Pasadena, California, felt “a huge sigh of relief, and excitement,” said principal investigator Scott Bolton at a late-night news conference. Juno's insertion into orbit was “tricky but flawless,” said NASA's Diane Brown. Scientists say Juno's 35-minute decelerating maneuver happened just as predicted. The spacecraft will make 37 orbits to map the planet's surface, following an elliptical path around the gas giant that exposes Juno to intense radiation. A 180-kilogram titanium vault shields its instruments from the hostile environment on each approach. Those instruments will probe beneath Jupiter's dense clouds to study its turbulent atmosphere, its gravity and its magnetic field, which is 20,000 times stronger than the earth's. Scientists say Jupiter is mostly composed of hydrogen and helium, like the sun, and that levels of oxygen and atmospheric water may give clues to the planet's formation. “We think the material we're going to be sampling… is essentially primordial, so that tells us something about the beginning of the solar system,” explained Richard Thorne of the University of California, Los Angeles, one of the scientists working on the mission. One question researchers will be trying to answer is whether there is water on Jupiter and how much. Because Jupiter is such a large planet, the more water it soaks up, the less there is for other planets in the system. Researchers also hope to learn whether or not Jupiter has a solid core. 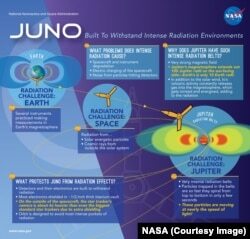 The solar-powered Juno spacecraft, built by Lockheed Martin, was designed for harsh environments. This is the second unmanned craft of the U.S. space agency NASA to orbit the gas giant. From 1995 to 2003, the orbiter Galileo studied Jupiter and its four largest moons, Europa, Ganymede, Io and Callisto. Earlier probes made fly-bys on their way to the outer reaches of the solar system. “NASA did it again,” said Juno principal investigator Bolton. In addition to carrying scientific instruments, the spacecraft has a camera called the JunoCam, which has already sent video of Jupiter's major moons. Bolton said the images, shown at the briefing, are the first of many to be taken in coming months, and that all will be made public. “The spacecraft is performing well,” said Guy Beutelschies of Lockheed Martin Space Systems, which built the orbiter. The craft will start returning the data from its close approaches to the planet August 27th. Juno project scientist Steve Levin said it will start to answer the “big questions” about Jupiter and the solar system.